It took seven families two years, but a group of homeowners in Scotland has taken on a housing giant in order to have their “crumbling” new-build homes repaired. It’s part of a broader, UK-wide issue – this is their story. Sheila Chalmers moved to Peebles with her husband 10 years ago. Her three-bed home was one of 250 built by developer Taylor Wimpey on a new site in the Scottish borders. Taylor Wimpey confirmed it did buy back a “small number of homes” to start with. The results suggested that there was far more sand in the mix than you would expect for a home in that area, although Taylor Wimpey says the type of chemical test used was “not appropriate” and the results could not be relied upon. They paid for their own tests, which showed only one in eight samples taken from their home met industry guidelines, although again Taylor Wimpey says the test used was “not appropriate”. “On the garage the tests came back showing it was just sand,” said Pete. In the end, seven core households became involved – passing on details to a wider community group on the estate. In 2017, they presented their findings to Taylor Wimpey’s lawyers, saying that they would go public if their properties were not fixed, demolished or bought back. The families’ solicitors received a letter back saying they had decided not to report the group to the authorities under the Proceeds of Crime legislation. That, they say, got Taylor Wimpey’s attention and – two years down the line – an agreement has now been reached for their home to be fixed. “It falls short of where we think a full repair should be, but they have said it’s that or nothing – so we have accepted it,” Jill says. In December 2018, Taylor Wimpey sent out letters saying all 130 houses in the estate built with the weaker mortar would now be offered “remediation” work. 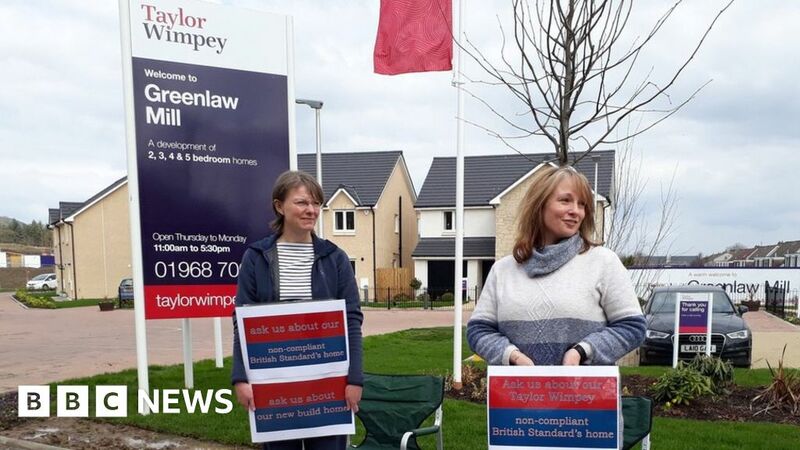 Taylor Wimpey said it “sincerely apologises” to the all the homeowners affected, is “fully committed to resolving matters” and has “a clear plan in place to remediate affected homes”. “This is a localised issue and falls short of the high-quality standards we uphold,” it said. It will refund the £16,000 she has spent on legal costs and technical reports, most of which she had to borrow. Repair work on Pete and Jill’s property, which may involve the demolition of the garage, is due to start in mid-July. “These developers, these companies, cannot be allowed to continue the destruction of people’s lives with building shoddy homes,” said Sheila.